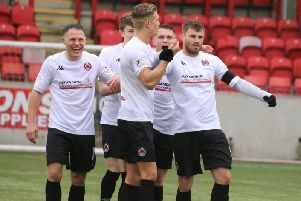 Cumbernauld United ended Girvan’s 100 per cent league record as they came from two down to earn a 2-2 draw at Guy’s Meadow on Saturday. There was a place in the starting line up for goalkeeper Connor O’Boyle and, with David Dixon on holiday, local boy Paddy McCabe filled the veteran’s boots. United were on the front foot from the off with the pace of Simon Eeles pace causing the visitors problems down the right and an early cross was knocked wide by Foley at the back post. United were enjoying plenty of possession but a quick counter attack by the visitors the nearly led to a goal when a cross from Mackie was met at the back post by Paterson and his effort looked a goal all the way but somehow O’Boyle managed to get a hand and deflect it wide. After dominating for the majority of the game United pressed the self destruct button when awarded a free kick wide on the right. Eeles tried a crossfield 60-yard pass which was intercepted by Moffat and he played in Michael Reilly who calmly stroked the ball home. United pressed hard for the remainder of the half but had little to show for their efforts and Johnston in the Girvan goal had little to do. It was much the same story in the second half with United pushing hard and Girvan sitting in and hitting on the break and on the hour mark they increased their lead when a move down the left and cross from Devlin was despatched in off the post by Reilly. United had it all to do but within five minutes pulled a goal back when Tony Stevenson played Eeles wide right. He cut in to beat two defenders and his shot deflected high into the net. Manager George Shaw then introduced a trialist to replace the hard working Tiffany and as the game entered the closing stages it paid off when the youngster was upended in the box and United were awarded a penalty which was duly despatch by Stevenson. United went all out for the winner but Johnston pulled off two great saves in the dying minutes to foil what would have been a great comeback. Overall it was a tremendous game and performance from United who, under new manager Shaw, look to be heading in the right direction. This Saturday United travel to Petershill. The supporters’ bus will leave Guy’s Meadow at 12.15pm and the town centre at 12.20.